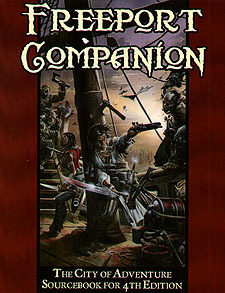 Freeport Companion is a 4th Edition rules supplement for the Pirate's Guide to Freeport. Its 176 pages are packed with all the support you need to run a 4E Freeport campaign. In addition to giving game stats for all the major characters, the Freeport Companion provides a new core class, famous magic items, an insanity system, creatures of Freeport, new rituals, and an introductory adventure.